Intel announced it, we asked for one, we were told no press samples, so we get one for ourselves. This is Intel's 40th anniversary of the original x86 microarchitecture with the 8086 processor, and to celebrate they released the Core i7-8086K, based on Coffee Lake with a turbo up to 5.0 GHz. With only 50,000 parts to be sold worldwide, 8,086 of which are given away for free in regional sweepstakes, Intel is being bold in trying to limit supply and actively promote its new mainstream headline act. As with most processors, it is all in the binning, and this is truly Intel’s highest performance mainstream processor ever. However the 8086K may not be all it's cracked up to be. Anniversary edition processors, or limited edition processors, have been hit or miss through the years. Back in June 2014, Intel launched the Pentium Anniversary Edition G3258 – an overclockable dual-core processor – to much fanfare, but no matter how much the CPU was overclocked it never performed close to a full quad core. In 2009 AMD launched a limited 100-part run of the Phenom II X4 TWKR – a part highly binned for performance world records – to a select bunch of extreme overclockers. It was never available at retail. 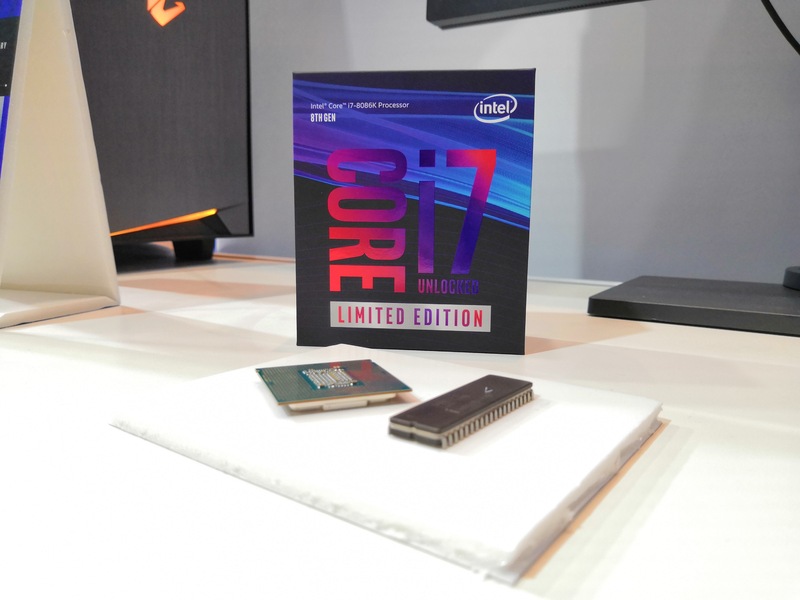 However, for Intel’s 50th anniversary and the 40th anniversary of the x86 architecture, the Core i7-8086K is now available to a ‘lucky’ 50,000 users. 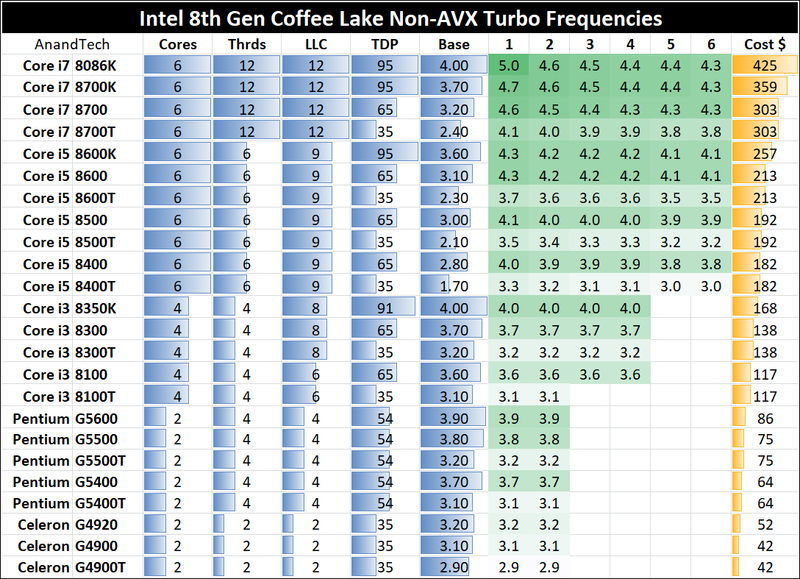 Plaudits go to David Schor of Wikichip, who originally suggested an 8th generation six-core Coffee Lake at 5.0 GHz called the i7-8086K for June 8th, the anniversary date. SKU: "Intel Core i7-8086K 40th Anniversary Edition"
Specs: 8th Gen (CFL), 6C/12T, 5 GHz Turbo, unlocked. Either David has moles in Intel, access to a time machine, or has the incredible ability to influence Intel’s manufacturing decisions – to request/predict the product as far back as January 18th is quite a feat. The Core i7-8086K is, as David says, a six-core Coffee Lake based processor that runs at a 5.0 GHz turbo. The part is, for all intents and purposes, a higher binned Core i7-8700K. The key thing to note is that the processor is not 5.0 GHz on all cores. The CPU still has an official rated TDP of 95 W, so rather than bumping up the TDP to give something extra, Intel is still playing within the limits of their TDP range. 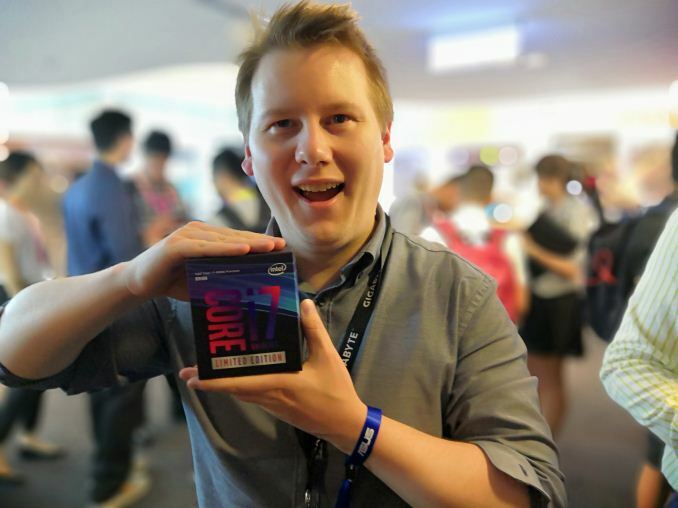 We have seen that the recent move to six-core processors on the mainstream platform is causing Intel’s processors to bump and exceed their usual TDP ratings, causing confusion for consumers and the press. It is important to note that Intel’s TDP rating is only valid at the base frequency, in this case 95W at 4.0 GHz all-core, and any turbo modes can run at any power consumption as required. This is something we’ll come on to at this review. So one of the key questions for this ‘faster’ processor is exactly how much faster it will be over the Core i7-8700K. Looking back several years, Intel launched the Devil’s Canyon range of processors as ‘better overclocking’ versions of the mainstream Haswell processors, which afforded more frequency and a better thermal response to frequency and voltage. If you were expecting the same thing for the Core i7-8086K, I’m afraid you might come away disappointed. For the Intel Core i7-8086K, it has exactly the same per-core turbo ratios as the Core i7-8700K, except for the single core. The single core turbo is boosted from 4.7 GHz to 5.0 GHz, but that is about it. Moving only the single core turbo has limited benefits. For all but the purest single core tests, on paper, there should be no difference at all. The problem here is that very few situations on modern machines only have a single core loaded: almost every user has programs running in the background, such as other browser tabs, virus scanners, or unscrupulous updates. Gamers, on the face of it, should expect to see little-to-no benefit. Technically the base frequency has risen from 3.7 GHz to 4.0 GHz, which means that Intel is guaranteeing a higher minimum frequency for the 95W TDP, but practically that means very little for users that just plug it into their system as the idea is that the processor never has to use that base frequency. There can be some argument that a 4.0 GHz base clock means that the processor is from a better binning process, and should overclock better, and that will be an interesting part of this review. However, as we will see in the results, the sole increase in single core turbo means that this processor is not as big of a jump as the ‘5.0 GHz’ number on the side of the box suggests. 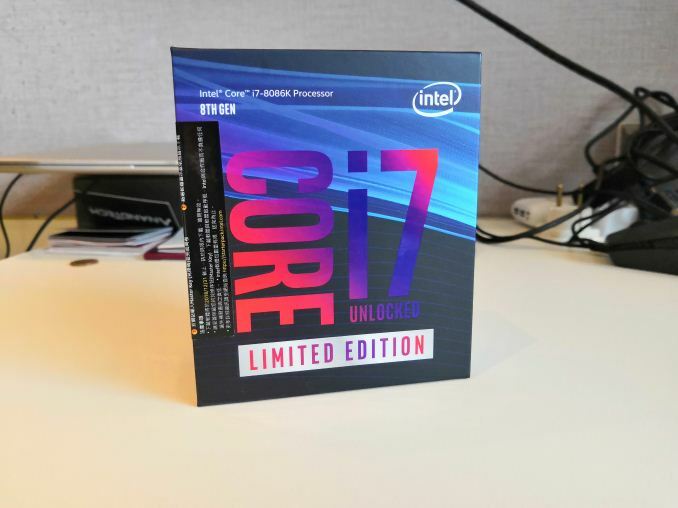 This is especially galling when considering the price of the new processor: Intel has the MSRP of the Core i7-8086K listed as $425, compared to the $350 retail price for the Core i7-8700K. This is a $75+ price difference, or even more when you consider that the 8700K periodically goes on sale for less than that. The CPU being tested here was not sampled by Intel. We were told while at Computex that Intel has no plans to seed samples to the media. This is somewhat disappointing, given how much fanfare Intel is giving to these new parts. However we are under the assumption that Intel will be able to sell every single one anyway, so additional media coverage to help drive sales might not be on the cards. As we’ll see in this review, there might also be other reasons for not sampling the media. At the moment, I’m still here in Taiwan for some post-Computex meetings, and will not be back home in my office for a few days. So when Intel said they were not sampling the CPU, we had two choices: try and win one in the sweepstakes and wait eight weeks, or wait until I get home and buy one. Or we could make our own third option – the AnandTech option: get ahold of one from the local shops and test it here. 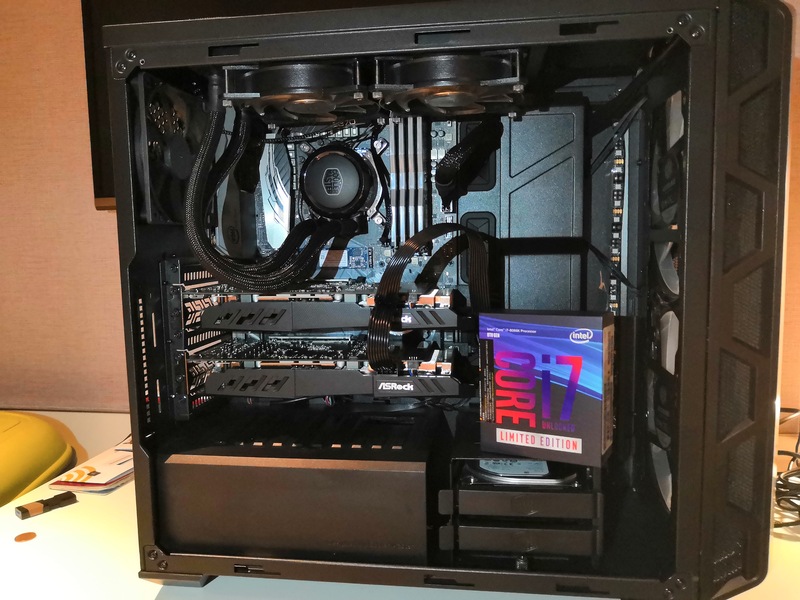 We reached out to partners to borrow a system for a couple of days to test in the hotel room, and ASRock beautifully stepped up to the plate on a Saturday when their office was closed. I bumped into my contacts on the show floor (after buying the CPU that morning) and they promptly arrived later that night at my hotel with one of the fully-built systems from the show floor and the few cables I needed. Big kudos to ASRock for enabling this testing. 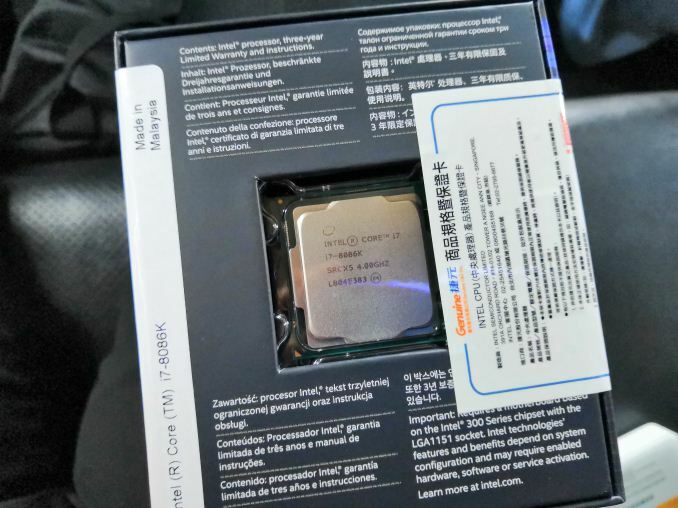 They also provided a Core i7-8700K as well. This test system is obviously different to my testing system back in the office, and normally for the sake of reviews we tend to keep the system constant between CPUs for consistency, however for the sake of expediency only the 8700K and 8086K numbers will have true parity here. It’s also a good thing I bought my review OS and benchmarks with me to Taiwan. Never leave home without them, folks. As mentioned, a big shout-out to ASRock for the system loan at such short notice. Without them this review would not have been possible within the time frame we wanted. It should be noted that as with previous reviews, our 'stock' CPU settings include setting the memory to the maximum supported frequency of the processor. 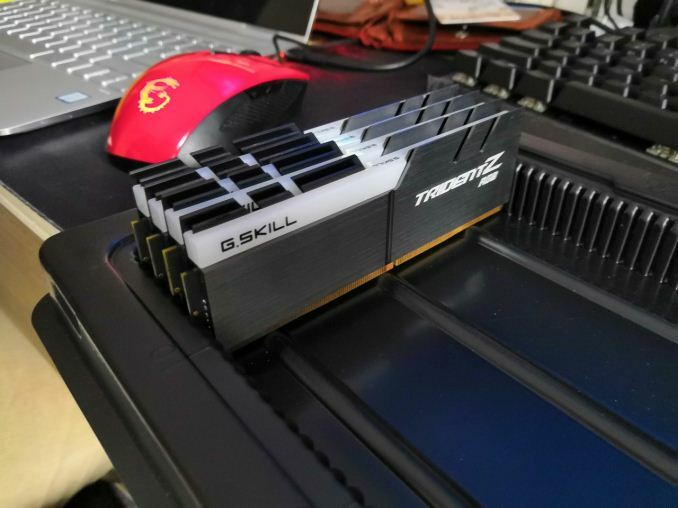 In this case, we use DDR4-2666 for Intel Coffee Lake CPUs. It should be noted that ASRock were not able to loan us the exact GPU that I normally use for our gaming testing. Instead we were able to source an RX 580, so this means that our gaming testing data will only have two data points: a Core i7-8700K and a Core i7-8086K. We will get some more data next week when we are back in the office. As mentioned, one of the key differences for this test is the motherboard. Back in the office we have used an ASRock Z370 Gaming i7 (P1.70 BIOS) for our Coffee Lake testing, while here we are using an ASRock Z370 Taichi (P1.80 BIOS). Different motherboards, even from the same company, use different methods of controlling the internal frequencies on the board (such as Uncore) or power limits (PL2) which can vary from BIOS to BIOS. It is hard to keep these consistent across systems, so there will be some differences in play.